During the last several years of the Sylvania Club’s existence, Sylvania ownership rested with two individuals: Lawrence Fisher of Detroit MI, who held three-quarters interest, and Clarence (C.M.) Christiansen of Phelps WI, who held one-quarter interest. In the early 1960s, after both men had died, Fisher’s heirs wished to dispose of their interest in the property, and it was decided that Sylvania would be offered for sale. Lawrence Fisher’s heirs, knowing his wishes to protect Sylvania under some conservation program and considering the property’s location within the Ottawa National Forest, favored a sale to the US Forest Service. A Forest Service acquisition was, however, not without controversy since it would result in the removal of this property from the tax rolls at a time of a declining local economy. Another potential buyer envisioned a huge recreational complex, with shopping centers, resort hotels, conventional facilities, and marinas (Cutler 1971). Assessments by several government agencies concluded that a Forest Service purchase would best serve the public’s interest because of the agency's traditional principle of multiple use and sustained yield. It was judged that the variety of recreational opportunities offered by Sylvania would draw visitors from afar, benefiting the area’s economy, selective tree harvesting would result in a healthier forest as well as generate revenue, while preserving much of Sylvania's unique characteristics. In 1966, the Forest Service purchased Sylvania from the heirs of Fisher and Christiansen for $5,740,000. This was the first major government land purchase through the Land and Water Conservation Fund Act. After more than half a century of private ownership, Sylvania was opened to the public in the spring of 1967. In September 1967, the First Lady, Lady Bird Johnson, officially dedicated the area to all Americans, with a ceremony at Clark Lake. Following the purchase, the Forest Service managed Sylvania as a Special Recreation Area for about 20 years. Primitive campsites were constructed on most lakes, along with portage trails between the lakes, for canoeists, kayakers, and hiker. At the north end of Clark Lake, a day-use building was erected. A visitor information center was build at the junction of US highways 2 and 45 to benefit the Watersmeet Township. More detailed studies by government agencies and universities of Sylvania's natural resources found that the recreational carrying capacity was less than that anticipated at the time of purchase. Sylvania's fragile soil and infertile lakes required a modification of the original management plan which had, for example, included a network of scenic roads, a lakeshore amphitheater, a campground and day-use area for several hundred families, and a concession stand. While some groups and individuals applauded the Forest Service's revised management plan, other groups and individuals (such as the Scierra Club's John Muir and Mackinac Chapters, a group called "Save Our Sylvania Action Committee", and Senator Gaylord Nelson) began to call for even greater protection of this unique area and proposed Sylvania’s inclusion in the National Wilderness Preservation System (Wilderness Act of 1964). The revised management plan was tested in court in 1968. 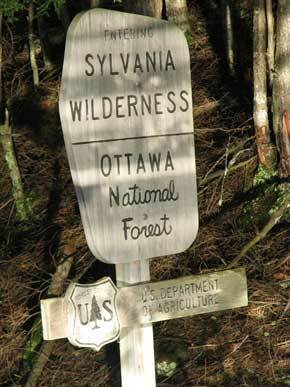 The Forest Service initially did not believe that Sylvania would qualify for wilderness status because of the roads, buildings, and other facilities. However, in the 1980’s the Forest Service studied Sylvania under the Federal RARE II process and ultimately recommended to Congress its designation as a Federal Wilderness. In 1987, more than 18,000 acres of Sylvania was designated by Congress as Wilderness (Michigan Wilderness Act of 1987). Over the next several years, the remnants of remaining buildings were removed, some campsites were closed (to provide more space between sites), and campsite and trail amenities (outhouses, picnic tables, most signs) were removed, in order to manage the area in conformance with wilderness regulations. The wilderness boundary for Sylvania was drawn so as to cross the water at the north end of Crooked Lake, one of the larger lakes in Sylvania. The entire lake could not be included within the wilderness, as there were several private properties (homes, cottages, and a resort) on the north bay of the lake. Therefore, the north bay of Crooked Lake is outside the wilderness, while the rest of the lake is within wilderness. Some of the private property owners on the north bay claimed historic use of boats with gas motors on the entire lake, and wished to continue this use even after wilderness designation. The Wilderness Act of 1964 generally prohibits the use of motorized equipment, including motorboats, but allows for the continuation of some pre-existing uses, subject to such restrictions as the Secretary of Agriculture deems desirable. The Act also directs each agency administering a wilderness to preserve its wilderness character. In 1994, the Forest Service prepared an “Environmental Assessment (EA) for the Use of Motorized Watercraft in the Sylvania Wilderness”. A decision and Forest Plan Amendment was ultimately issued, based upon the analysis in the EA, to allow only electric motors (up to 48 lbs. thrust) for all watercraft users within the wilderness portion of Crooked Lake (as well as Big Bateau and Devils Lakes on which there also had been pre-existing use of gas motors), beginning April 1, 1996. Several court cases, initiated by two private property owners on Crooked Lake (the owners of the resort and the owner of another private property) ensued over this decision. The federal courts affirmed the Forest Service’s authority to enact regulations to protect the wilderness character of Crooked Lake and affirmed the regulations that have been enacted. The courts also ruled that the two private property owners who challenged the Forest Service regulations, and their guests, are permitted to use gas motors on the entire surface of Crooked Lake. This court order still stands today , though it now applies to only one property owner and the owner’s guests, since the resort was sold and no longer allows gas motors. All other users must either power their boat/canoe by hand, or are permitted to use electric motors (only), up to 48 lbs. of thrust, on the wilderness portion of Crooked Lake. The use of gas motors within the wilderness portion of Crooked Lake by some watercraft users continues to be a source of controversy among users of Sylvania, and is not yet fully resolved.